Marie Danforth Page was born in Boston in 1869, and became a popular and successful portraitist. 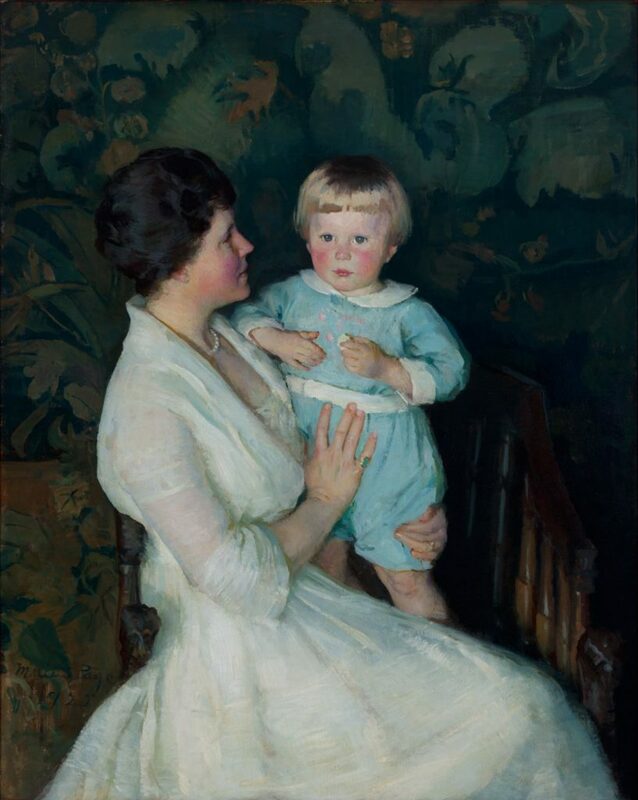 While she had many commissions, the subjects she was most recognized for were mothers and children. Page studied with Helen Knowlton from 1886 to 1889 and at the School of the Museum of Fine Arts with Edmund C. Tarbell and Frank W. Benson from 1890-1895. The subject matter of this work is one of the most traditional in art history, although the artist makes the work contemporary through her use of a patterned background, which could be wallpaper or drapery. This was a popular convention in turn-of-the twentieth century portraiture, and often referenced the popular patterns and forms of the Arts and Crafts and Aesthetic Movements.